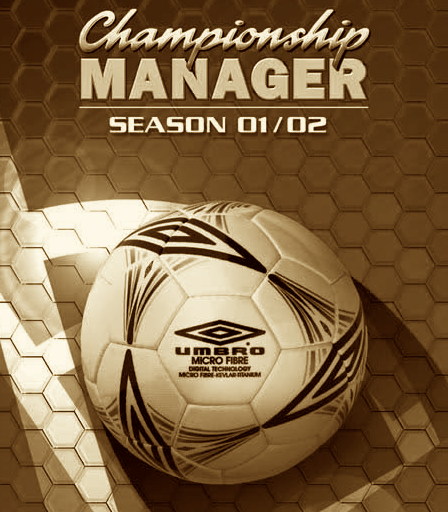 ALL EPISODES: Pre-Season ’01; Pre-season ’01 Pt2; September ’01; October ’01; November ’01; December ’01; January ’02, February ’02. There is nothing we can do now, except wait. We have no money. We have a host of injuries. No-one expects us to do anything other than battle bravely against relegation. 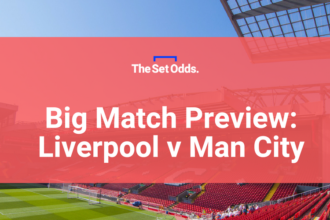 And, of course, we have to play Liverpool in the first game of the season. But not before they’ve played Arsenal in the Charity Shield. Preparation might be the only thing that saves me in this mission and so I opt to view the game, just in case I can learn something. I learn very little. It’s a drab encounter and it ends with one of the worst penalty shoot-outs in the history of football. But at least Pascal Cygan turned up. But while we can’t buy anyone, there’s nothing to stop anyone else from spending their money. Barcelona, who were struggling a little in these days, reliant on ridiculous-last-day-of-the-season-overhead-kicks from Rivaldo just to get them in the Champions League places, have gone big. 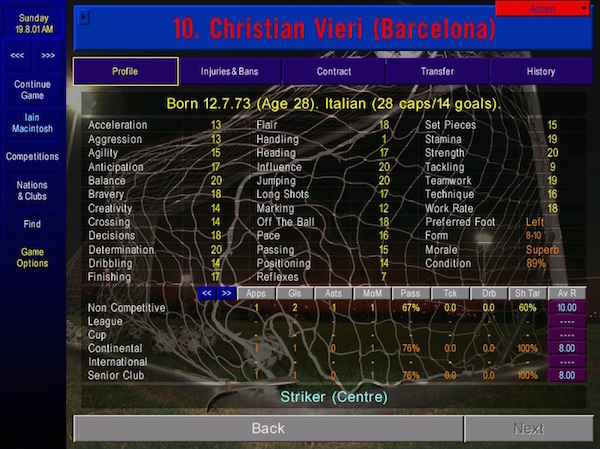 For an eye-watering fee of £32.5m, they snap up Christian Vieri from Internazionale. Just look at those attributes. Oh, to have a player like that at my disposal. But I’m sure Kevin Campbell will do me just fine. Still, there’s no point moaning about our financial plight. It is what it is. What we lack in resources, we more than make up for in…erm…well, we’ll do our best. And we’re sticking with that Chilean-looking formation that worked so well against mighty Cheltenham. Alessandro Pistone will man-mark El Hadji Diouf, Steve Watson will take care of Michael Owen, Alan Stubbs will hang back and mark zonally because he’s so cripplingly slow that it would insane to have him do anything else. We’ll tackle hard, pass the ball properly and hope that it all works out when we get there. And it very nearly does, despite a most inauspicious start. Pistone is out-jumped by Diouf after just six minutes and it looks as if we might be in for a humiliation. But God bless ’em, my misbegotten collection of cloggers refuse to capitulate. 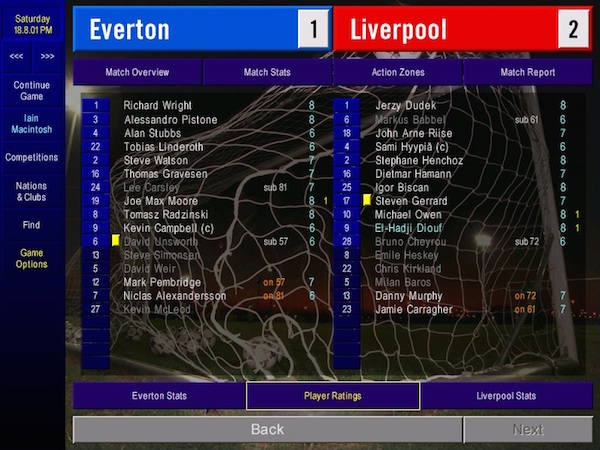 Joe Max Moore links up nicely with Tomasz Radzinski to strike an equaliser five minutes later and then we take control, peppering the Liverpool goal with shots. 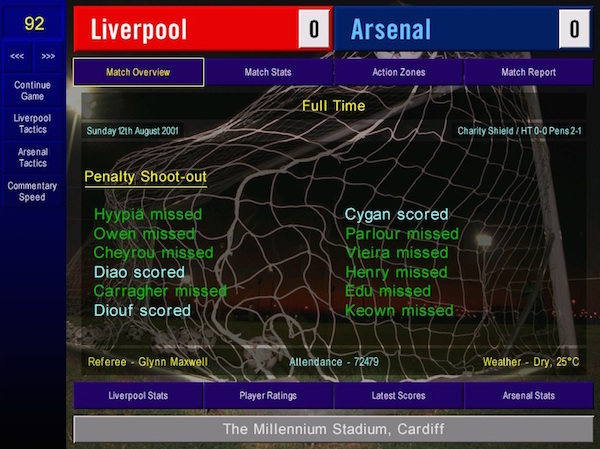 Unfortunately, Jerzy Dudek is putting in the kind of performance that he won’t replicate until four years later in an alternative reality Istanbul. Again and again, we break through their lines. Again and again, he thwarts us. And then, inevitably, Owen scores against the run of play in the second half. Damn you, Gerard Houllier. Damn you straight to Hades. But at least we played well. We can take something from this, really we can. And besides, it could be worse. In this reality, Manchester City have very little money and a magnificently eclectic, if limited, squad of players. 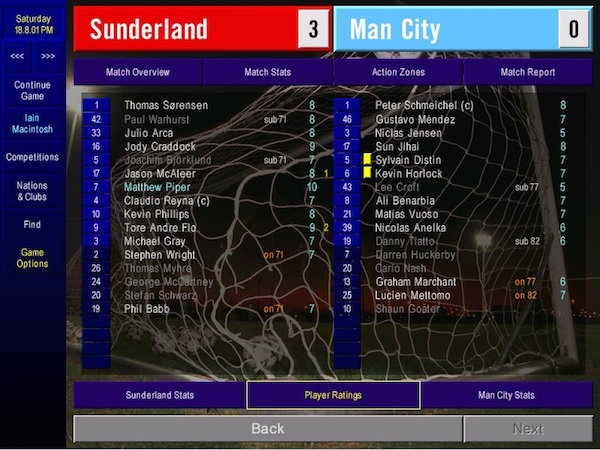 They are quickly put to the sword by a devastating Sunderland side, spearheaded by Tore Andre Flo and powered by one Matthew Piper. They could be the team to look out for this season. For now though, our attention shifts to Blackburn Rovers and a trip to Ewood Park. Annoyingly, they are a mystery wrapped in a riddle and locked inside an enigma. Graeme Souness played all of pre-season with a 4-4-2 and then opened up the campaign with an all out defence formation that garners a 1-1 draw with Tottenham. I opt to stick with the weird 3-4-3 that worked well, but not well enough, against Liverpool. But two days before the game I’m hit with the news that Joe Max-Moore is injured. It’s not that the 30 year old American is one of my best players. He’s really not. It’s just that he’s the only senior player who can operate in the hole. 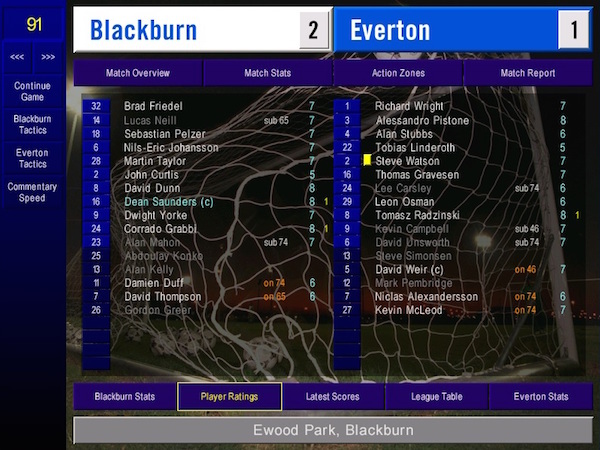 Leon Osman has tried and failed for the reserves, but he’s my only option. It’s another defeat and it’s not an encouraging one. 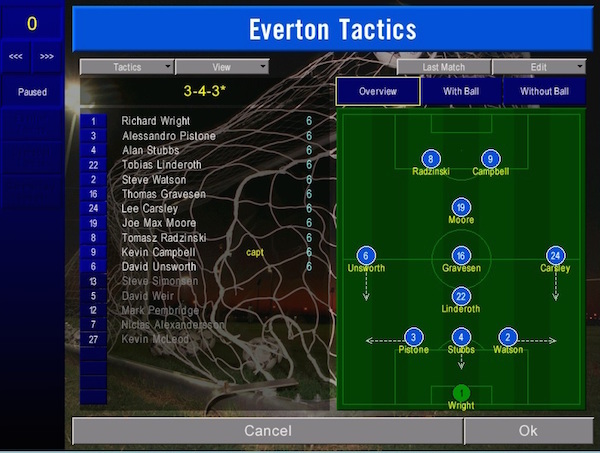 Souness goes with an attacking 3-5-2 that has Dean Saunders floating around behind Corrado Grabbi and Dwight Yorke. To counter this, I instruct Thomas Linderoth to sit on Saunders and kick him repeatedly. But it doesn’t work. First Saunders sets up Grabbi for an early goal, then he goes and scores one for himself after 20 minutes. This is all going horribly wrong. Thomas Radzinski snatches one back, but we don’t deserve it and I’m fortunate not to be further behind. 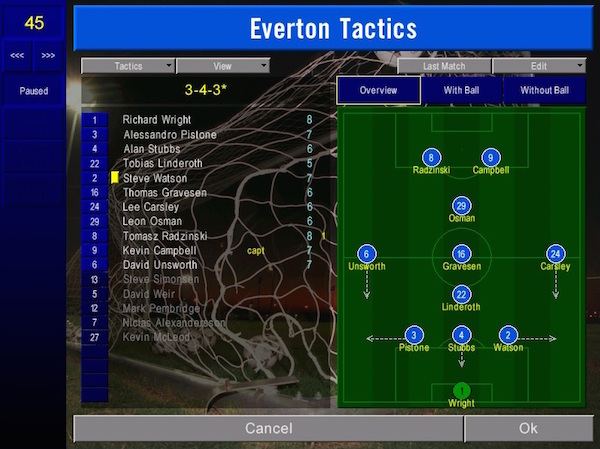 At half-time, I switch to 4-5-1 with David Weir coming on for Kevin Campbell. We’re far more solid and we start making chances, but Brad Friedel keeps us out. Two games, two defeats. This could be a very short series. Desperate for some kind of attacking edge, I give some thought to promoting my 15 year old Wayne Rooney to the first team. I send him out against the Manchester City reserves. Half an hour before the end of an anonymous performance, he limps off injured. It was a silly idea anyway. 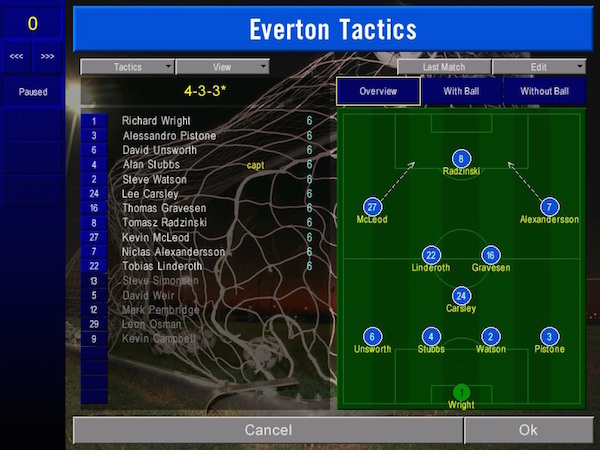 The 3-4-3 doesn’t seem like the kind of formation you want when you’re desperate for a win and you’re playing Kevin Keegan’s Manchester City at home. I watched their 2-0 victory over Fulham and they’re a dangerous team. But they’re also a stupid team. They play 4-4-2 with Ali Bernabia rushing out of the middle to push up front. They leave gaps. If I pack the midfield, I should dominate possession. I opt for a 4-3-3 and cross my fingers. Finally, we pick up three points. And we’re worth them all. For the third time in a row we come up against a goalkeeper in inspired form. This time it’s Peter Schmeichel who frustrates us, but even he can’t keep Radzinski out forever. We take the lead in the first half and sweat blood, tears and innocence in holding out until the end. Half-time sees a switch to 4-5-1, we go defensive on 70 minutes, get men behind the ball on 80 and, thanks to Richard Wright, survive until the final whistle. This is a profoundly satisfying victory. As August draws to a close, we have demonstrated that we can play clever, defensive football. And we can win. Perhaps there is still hope. Perhaps we can still survive. 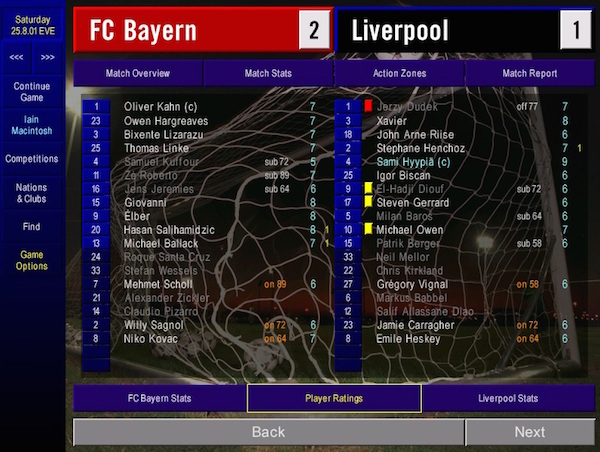 Elsewhere, Liverpool miss out on the European Super Cup when Jerzy Dudek gives away a late penalty, gets himself sent off and then sits in the bath listening to the roar of Bayern Munich equalising from the spot and then smashing home a winner in injury time. Obviously, everyone at Everton is very sad to hear about this. 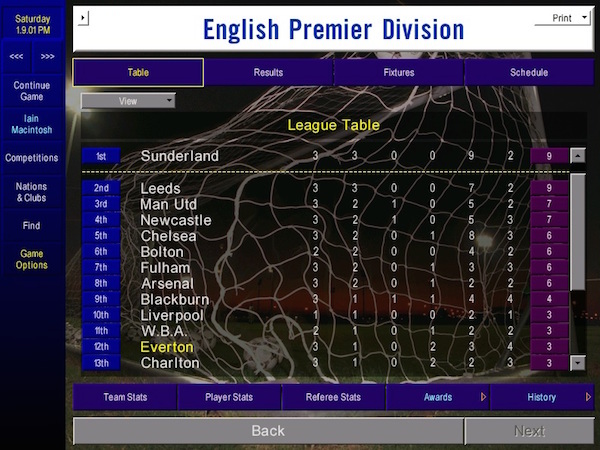 But the real fun is being had by Sunderland and Leeds United, both of whom end the month with 100% records. Arsenal and Manchester United’s supremacy is supposed to be safe in 2001, but unexpected challenges have emerged. And who do Everton play in September? Ah, yes. Sunderland and Leeds United. You can find the next episode, here.